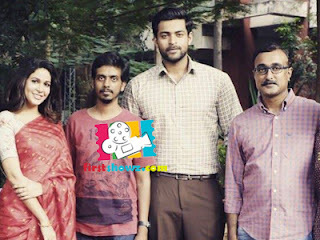 Starring Varun Tej, Aditi Rao Hydari and Lavanya Tripathi in the lead roles, the first ever Indian Space genre movie titled Antariksham 9000 KMPH shoot has been completed. The movie is slated for a release on December 21. Varun Tej shared the shoot update along with pic of the unit members and the shooting location. The young actor says that he had an amazing experience working for this movie. Sankalp Reddy who debuted with ‘Ghazi’ donned the director cap for the movie, with rich production values. A Hollywood team has supervised the action sequences for the Antariksham 9000 KMPH, besides working on the visual effects. Antariksham 9000 KMPH teaser trailer will be launched soon. Produced jointly by Krish Jagarlamudi, Sai Babu Jagarlamudi and Rajeev Reddy under First Frame Entertainments banner, the film has Gnansekhar's cinematography.